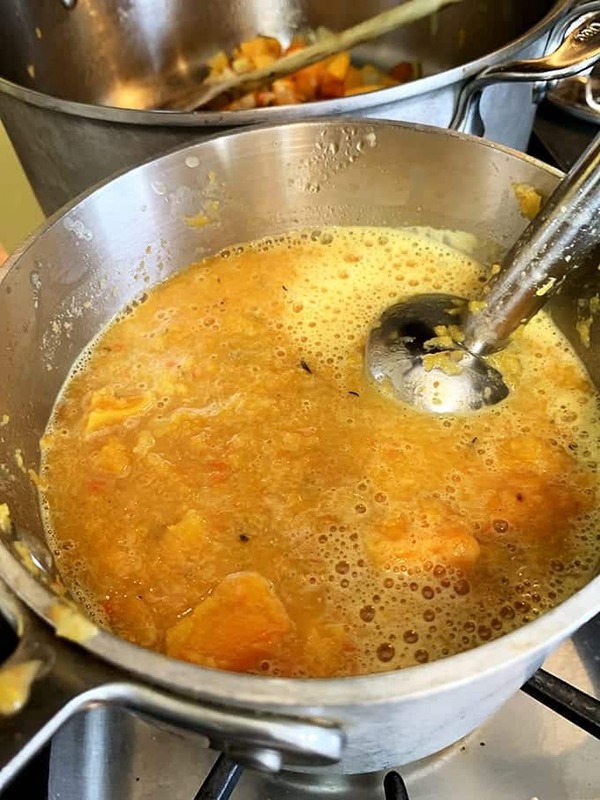 Roasted Butternut Soup is an easy, healthy recipe with a great tasting flavor, thanks in part, to the miracles of caramelization. It’s equally simple to make, thanks to the availability of pre-peeled and diced butternut squash from your local grocery store. This roasted butternut squash soup recipe is ready to eat in under an hour. If you’ve ever wondered how to peel butternut squash, I’ve found the most convenient method is to stop by your nearest Costco where you can buy a pound or two of it sliced, diced and ready to go. Save yourself a boatload of time and use pre-peeled and diced squash for this healthy soup recipe. I’m not the neatest guy in the kitchen and lining a baking sheet with parchment paper helps make clean-up easier. 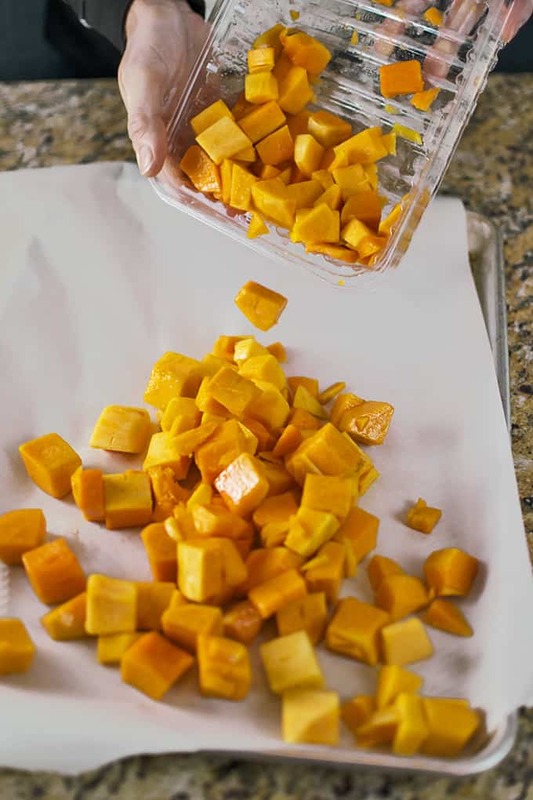 Before roasting this butternut squash, blot it dry with a paper towel. 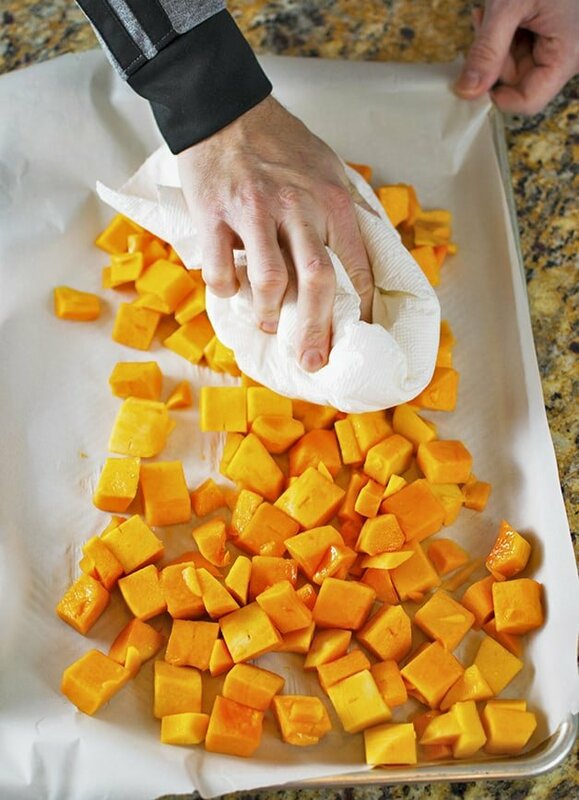 Once you have the butternut squash in a single layer on the baking sheet, use a paper towel to blot it dry. Doing so will enhance the caramelization process. 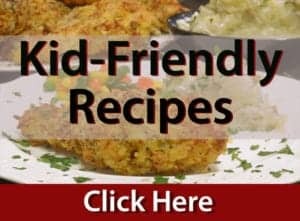 In short, caramelization is the browning process that brings out the sugars and other flavors in foods that are roasted or browned using some other method such as searing. 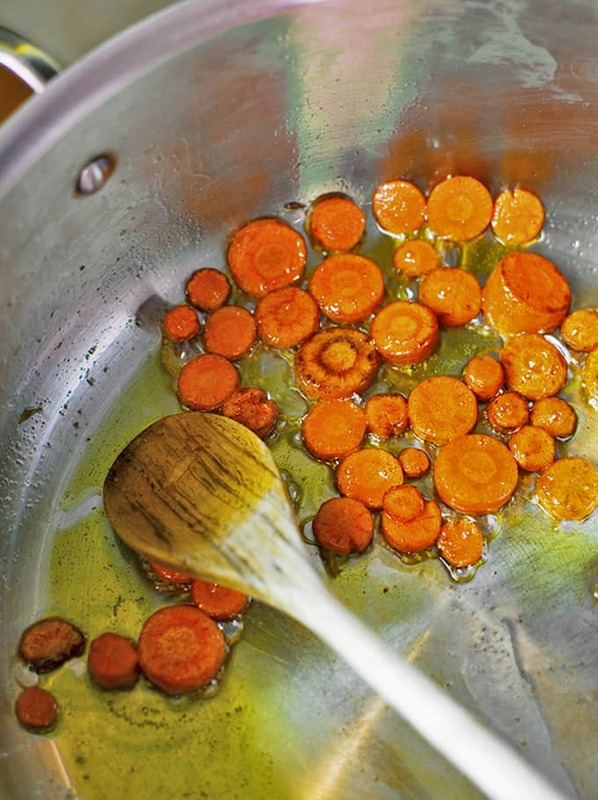 Always remove excess water by the method shown above, before roasting or searing any food. 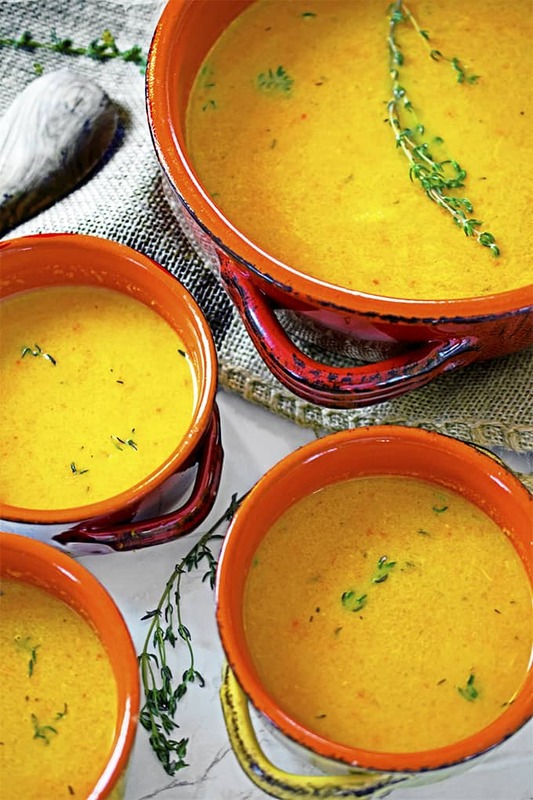 We use fresh thyme in this roasted butternut squash soup recipe. After you have blotted the butternut squash with a paper towel, you’re going to get a wet again, but this time with some healthy extra virgin olive oil. Then, you’ll toss in pinch or two of kosher salt, some fresh ground black pepper, and finally some fresh thyme leaves. Roast the butternut squash for about 30 minutes in a 400° F. oven. There’s that word again: Mirepoix. We’ve made so many mirepoix here on Platter Talk that if we had another kid, we would probably name them Mirepoix. A mirepoix is simply a flavor base that is made from sauteeing diced vegetables, usually in butter, oil or some other fat. When making a mirepoix for the flavor base of your dish, use the classic ingredients as listed above. Or, improvise and make your own mirepoix using other aromatics such as garlic, leeks and other fresh ingredients like bell peppers and mushrooms. I like to start my mirepoix with carrots. If you want to add some extra flavor and sweetness to your mirepoix, saute the carrots until they are a soft, caramel color. This will take about 10 minutes over medium-low heat. Also, I love to use rainbow carrots for extra depth and color! After the carrots are soft and ever-so-slightly “tanned,” I add the other ingredients to my mirepoix. Add the roasted butternut squash to the mirepoix. When the butternut squash is soft and starting to get that brown, caramelized color, it’s time to add it to the mirepoix. Then add some warm broth. Right about now is when people from all over our little house will start to drift into the kitchen. I admit, that’s always music to my aging ears. Use an immersion blender to blend the ingredients for this roasted butternut squash soup. 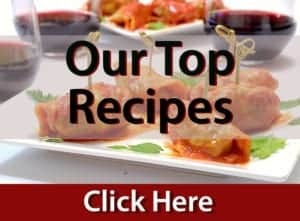 If you have an immersion blender, it’s a good way to blend the ingredients to your desired consistency. If you don’t have an immersion blender, carefully transfer to the soup to a blender and blend away. Just be super careful not to burn yourself. 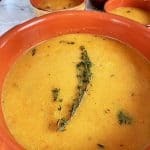 I learned that my kids like a creamy consistency with this butternut squash soup, while I prefer a little more texture. 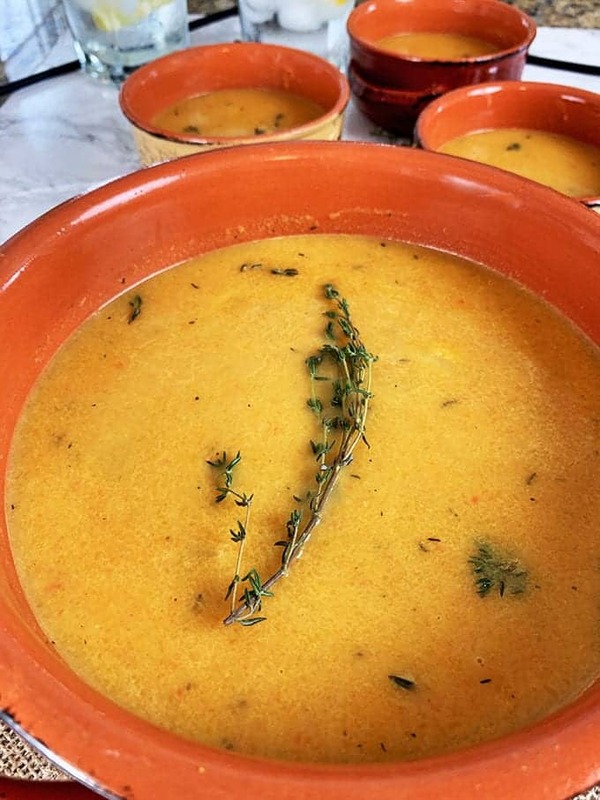 Garnish this roasted butternut soup with fresh thyme. 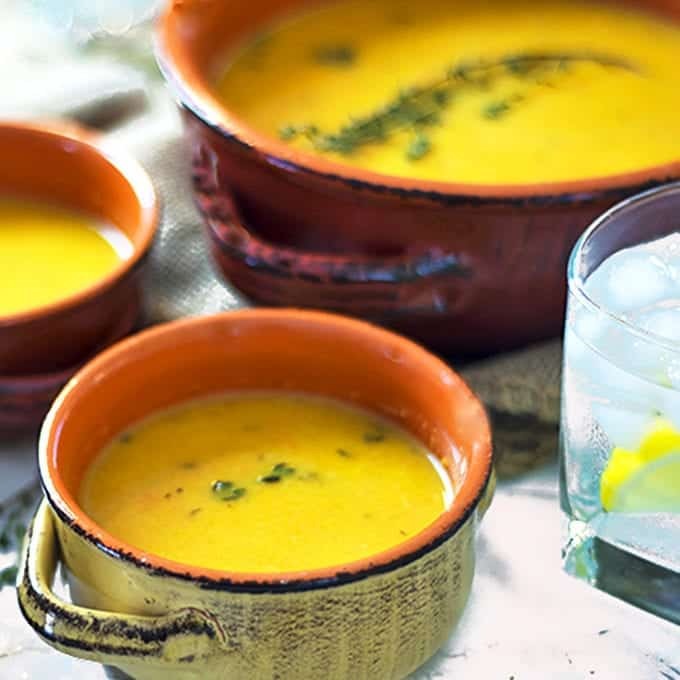 We accent the flavors of this roasted butternut squash soup with fresh thyme. Other great herb options might include basil, oregano, marjoram, rosemary, or tarragon. Try this roasted butternut squash recipe soon! Use what you have on hand to make this healthy soup recipe and remember: Make. It. Your. Own! This Roasted Butternut Squash Soup is easy to make. 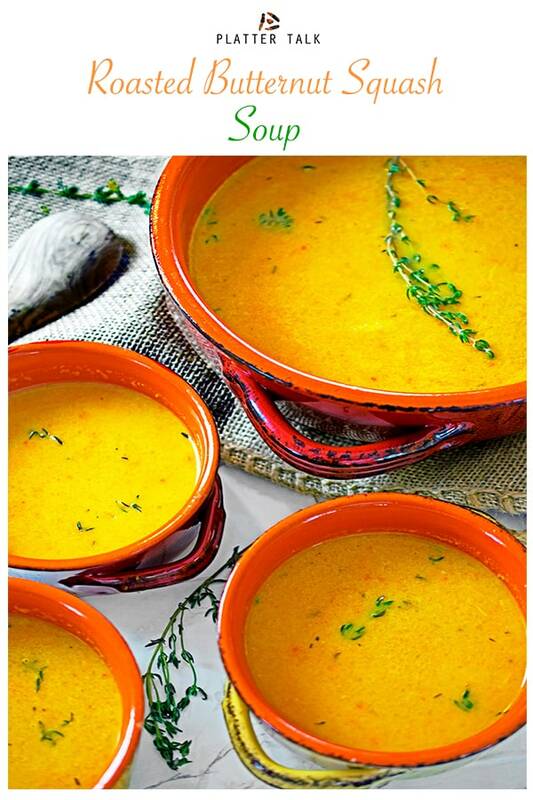 Try this healthy soup recipe today! 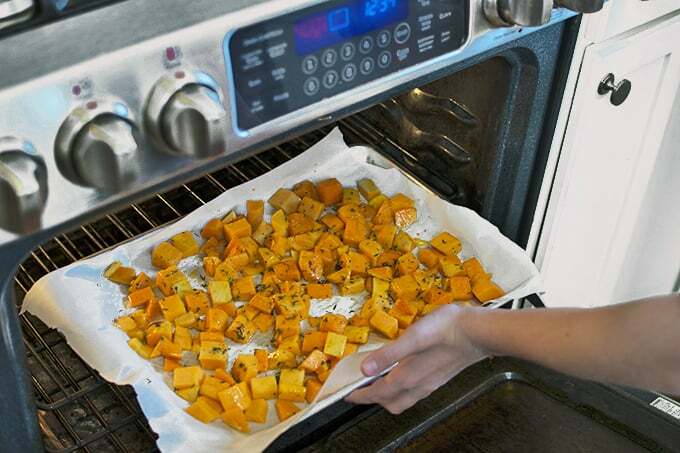 Pre-heat oven to 400° F. Use a paper towel to blot the squash and arrange in single layer on a baking sheet lined with parchment paper. 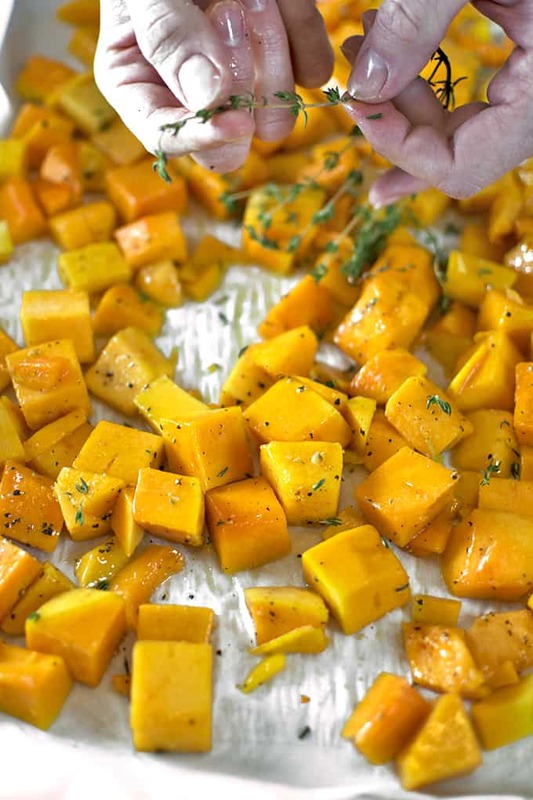 Toss the squash with 2 tablespoons of olive oil, salt, pepper, and fresh thyme leaves and place in hot oven for 30 minutes or until tender. While the squash is roasting, saute the mirepoix by heating the remaining olive oil and butter in a soup pot, over medium-low heat. Add a few more thyme leaves and saute for 7 to 10 minutes. 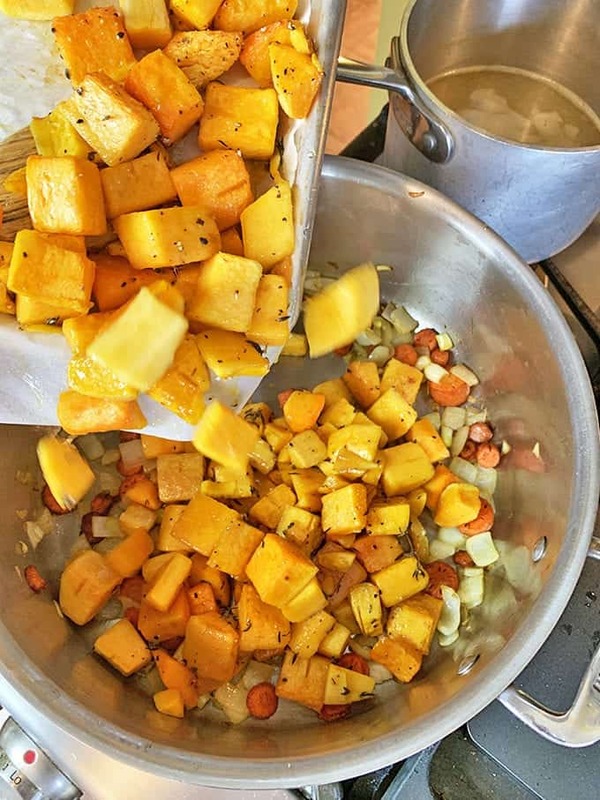 When the squash is finished roasting, add it to the soup pot with the mirepoix and then add the warm chicken broth. Simmer for about 10 minutes and then use an immersion blender to blend to desired consistency. Season with salt and pepper to desired taste. Serve and garnish with additional fresh thyme. Pure maple syrup (maybe a tablespoon or so). Roasted butternut squash soup sounds so amazing! We’re in for a week of cooler, rainy weather so what perfect timing to come across a warm, hearty soup recipe. We’ll definitely have to give this a try! Roasting the butternut squash first is such a good idea to bring even more flavor into the soup! This looks so perfect for a cold, snowy day. I love everything butternut squash! I often make soup with it too, but never tried this roasted version, I’m sure it tastes AMAZING! Will try it soon. I love butternut squash soup. It’s on my menu throughout the whole year, no matter what season. Your recipe sounds so interesting. Love the addition of thyme. Must give this recipe a try. I love butternut squash soup, it’s one of my all time favourites! This version looks and sounds amazing, I can’t wait to try it! I love roasted butternut squash, and it makes such a creamy soup! I usually added roasted red pepper to my squash soup, but I really like that you added carrot. Definitely need to try that next time I make it! I love soup for Dinner any day. This Butternut Squash vegetable is my first try. Looks delicious and creamy. This roasted butternut squash looks SO good. I love the addition of celery and carrot here. I also just love roasting the butternut squash with fresh herbs. SO tasty! Butternut squash is one of my favourite seasonal vegetables, and soup is probably my favourite way to use it. It gives such a lovely, smooth texture and the colour is gorgeous too! Thanks for the comments, Anna! I love squash more and more, everytime I cook with it.